It might be a tad fallacious to say that Sunday 18th March dawned bright and fair, in fact it was slightly dull and drizzly, but the weather did nothing to dampen the spirit of a fun packed Mother’s Day here at the Sanctuary. 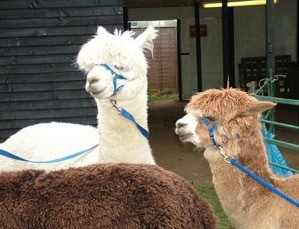 Special attractions on Sunday included the Willowmead Alpacas, which are based a few miles north of Ipswich in Suffolk. Three of the Alpacas came to visit and enthral visitors with their gentle expressions and amazingly thick fleece coats. Visitors had the opportunity to go for ‘Alpaca walks’, leading them around the flying ground and even, once the Alpacas became more used to their environment, into the woodland walk. Alpacas look very similar to and are closely related to Llamas and tend to have a bit of a reputation for spitting, but actually they are only likely to spit at each other on occasion and, when handled properly as youngsters, are very good around people. 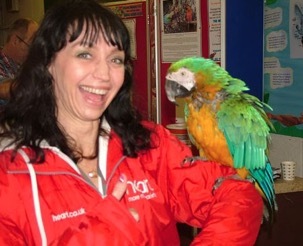 We were also visited by Cleo and Bo the Macaws, who came with their owner, Simon, from Ipswich Macaw & Parrot Rescue. Cleo and Bo are both very friendly and were quite happy to be stroked and have a fuss made of them. Visitors were able to ask questions and Simon gave them lots of information about how to look after Parrots and Macaws. At one o’clock, the falconers put on an exclusive pre-season flying display as a particular treat for Mother’s Day. The flying team consisted of Auckland, Phyllis, Pungu the Bateleur Eagle and Nell the Falcon. As usual they gave their audience a wonderful demonstration of their grace and beauty when in flight. There was plenty for the kids to do, including having their faces decorated by our visiting face painting artist John and a special ‘pot-a-plant’ workshop, where kids could plant their own cornflowers and decorate the flowerpot to give to mum as a lovely Mother’s Day gift. Visiting mums also had the opportunity to have their photo taken with either Phyllis our gorgeous Spectacled Owl, or Auckland our diminutive Southern Boobook Owl. Of course, our beautiful Mums were the stars of the day and Phyllis was happy having her photograph taken with them. To mix our avian 'metaphors', she took to it like duck to water! 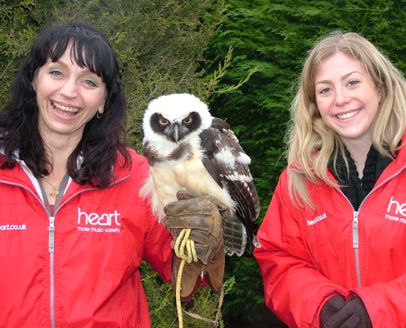 In addition, we were very lucky to have two of Heart Radio’s Angels with us to share the day. They came armed with goodies and were kept very busy handing out daffodils, sweets and flags to all our guests. We would like to say a big thank you to them and to all our other visiting attractions for helping to make the day such a wonderful one.